The old concept of a meal always having to consist of ‘meat and two veg’ is now well and truly buried and there is no nutritional requirement for us to eat meat or fish every day, as most of us actually get too much protein. 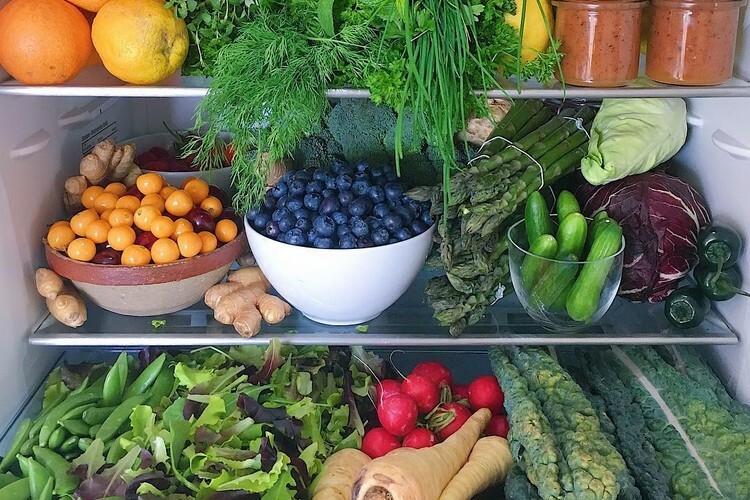 For a healthy, balanced diet it is a good idea to have at least two vegetarian meals during the week, as they are full of fibre and all sorts of nutritional goodies. There are many days during the week where I prepare a nice big salad, a vegetarian stew or pasta with vegetables. The important thing is that it has to be gastronomically interesting; it has to contain lots of flavours and texture. So use your imagination and experiment with all the wonderful array of vegetables, herbs and spices. 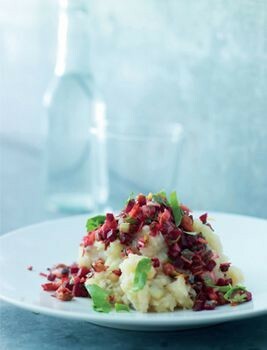 This mash with sautéed leeks, celery, beetroot and walnuts is actually quite easy to prepare and makes a very tasty vegetarian dinner. It is one of my winter favourites. To a large pot add the celeriac, potatoes, garlic, peppercorns, salt and bay leaves. Cover generously with water, bring to the boil and then let simmer for 30 minutes. While the vegetables are cooking, prepare the topping: heat the oil in a sauté pan, add the garlic and beetroot and cook gently for 5 minutes. Add the rest of the vegetables and the walnuts. Continue cooking for 5 minutes more. Season to taste with salt and pepper. Keep the sauce warm. Drain the vegetables and place in a big bowl, discarding the bay leaves. Add the rapeseed or olive oil and mash, mixing everything well together. Season to taste with salt and pepper. Serve the mash in a bowl, topped with the mixed vegetables. If you don’t have much time to cook every day, it is a very healthy and easy solution to prepare pasta dishes with lots of vegetables and serve them with a green salad. I also believe that it is a myth that we should not have pasta for dietary reasons. Of course we shouldn’t eat pasta portions the size of Mount Everest, but dishes with 75–100g of pasta per person are fine. Remember that the planet’s population grew to over 6 billion people mainly on wheat and rice. Pasta also contains protein and the level of protein is even higher in spelt pasta. Break off and discard the lowest third of the asparagus where it snaps naturally and cut the remaining stalk in half lengthwise. Cook the pasta in salted boiling water, not stirring for the first 3 minutes as spelt pasta breaks easily, until al dente, about 8–10 minutes. 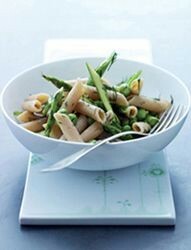 While the pasta is cooking, heat the olive oil in a sauté pan and add the garlic, asparagus, spring onions and peas. Cook gently for 5 minutes over a medium heat. Take care that the garlic does not burn. Drain the cooked pasta; mix with the vegetables and season to taste with salt and pepper. Serve right away, scattered with the dill. TIP Here in the Nordic countries, we also eat our pasta with Parmesan or Grana Padano. I really love my vegetable pasta with a scattering of nice cheese on top. I really believe we should nurture inspirations we have received from other food cultures and I will never give up what I have learned from my European neighbours. We cannot – and should not – roll back time. Grains can be eaten in many ways; this is lovely comfort food, very tasty and very filling. It is also a great way to use up leftover vegetables, as all vegetables can be used. Peel the butternut squash and cut the flesh into 1cm cubes. Place in a roasting tin and mix with 1 tbsp of the olive oil, and some salt and pepper. Bake in the oven for 10 minutes. Meanwhile, rinse the barley in cold water until the water runs clear. Boil in plenty of salted water for 20–25 minutes or until tender. Drain and set aside. Chop the mushrooms and tomatoes into chunks. Add the rest of the olive oil in a big sauté pan and sauté the garlic, shallot, sage, rosemary and bay leaf for 3–4 minutes. Add the mushrooms and tomatoes and sauté for 5 minutes. Add the boiled barley, baked butternut squash, lemon juice, butter, and some salt and pepper. Stir and let it simmer for 5 minutes. Nowadays, rye or spelt pasta can be very good quality. 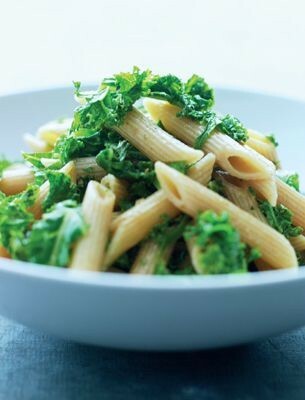 With kale, it makes a simple dish that is perfect during the week. As an additional bonus, it only takes 20 minutes to cook for dinner. Cook the pasta in salted boiling water, not stirring for the first 3 minutes as rye pasta breaks easily, until al dente, about 8–10 minutes. Cut off and discard the tough stalks from the kale, roughly chop the leaves and rinse well. Heat the olive oil in a sauté pan, add the garlic, shallot and chilli, and cook gently for 2 minutes. Add the kale and continue to cook for 5 minutes. Season to taste with salt and pepper. Drain the cooked pasta and mix the kale mixture into it. Serve right away with a side salad. TIP In summer, replace the kale with broccoli. Beetroot is in season from May to November, but tends to be smaller in the spring, and the autumn harvest keeps well through the winter. A good rule is to go for the smaller ones for tenderness, especially if planning to use them raw in salads, and avoid very large ones, which may have a woody core. Try to get them with their leaves, which are also highly nutritious. Mix the ingredients for the burgers well in a bowl, and allow to rest in the refrigerator for 1 hour. 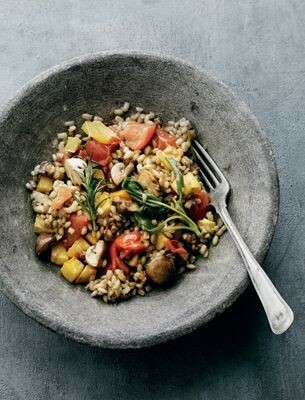 Prepare the barley for the salad: boil it in water with a little salt for 30 minutes. Drain and allow to cool down. Set aside. Preheat the oven to 180°C/gas mark 4. Form flat cakes of the burger mixture with your hands. Heat the oil in a frying pan and fry the cakes until golden on both sides. Transfer them to an ovenproof dish and put in the oven for 20 minutes. 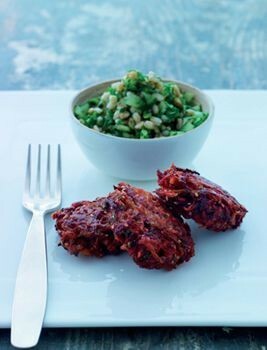 Serve the beetroot cakes with the barley salad. It is also a great idea to serve the horseradish dressing on Fried herring with beetrootand horseradish sauce with this dish. TIP The burgers can be made the day before and reheated. 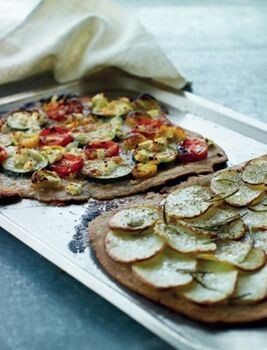 Nordic pizza for me is like regular pizza, but just with some wholegrain rye or spelt flour added to the base. Choose either the potato topping or the courgette and tomato topping to make 2 pizzas – enough for 4 people. Dissolve the yeast in the water in a big mixing bowl, then add both flours and the salt. Mix to a dough, then knead well until smooth. Cover the bowl with a towel and leave to rise for 2 hours at room temperature. Roll the dough out to 2 very thin, large squares, each about 35cm. Place on a lightly oiled baking tray, then brush the tops with olive oil. To make the potato topping, place the potato slices evenly over the pizza dough, brush again with olive oil, scatter the rosemary on the top of the potato and sprinkle with salt and pepper. To make the courgette and tomato topping, space the courgette slices and tomato halves evenly out on the dough, then spread out the ricotta. Sprinkle with salt and pepper. Bake the pizzas for 20–25 minutes. Serve with a green salad. This is my version of ‘biksemad’, a traditional dish normally made using leftover meat and potatoes with onion and Worcestershire sauce. It is usually served with eggs fried sunny side up and tomato ketchup. I developed this recipe when I was a vegetarian for some years. Enjoy my biksemad; it is the best healthy hangover food in the world! 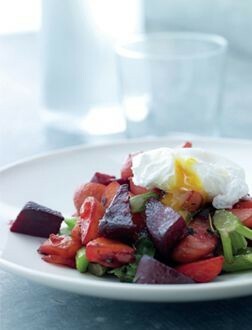 Heat the oil in a frying pan, then add the onion and beetroot. Cook gently over a medium heat for 5 minutes, then add the potatoes and carrots and continue cooking for 10 more minutes. Lastly add the celery with some salt and pepper, and cook for 5 minutes more, stirring often so the vegetables do not stick to the pan. Poach the eggs just before serving: use a sauté pan deep enough to hold 7–8cm of water and big enough to accommodate all 4 eggs at once. Add the vinegar (3 tablespoons per litre of water) to the water and bring to the boil. Break each egg into a heatproof cup and carefully lower it into the water. Lower the heat and simmer for 4 minutes. Remove the eggs with a slotted spoon and serve on top of the biksemad, sprinkled with chives. TIP If you like Worcestershire sauce, add a couple of spoonfuls to the mix and serve with organic ketchup. The chard can easily be replaced with broccoli, a very healthy vegetable – and we have grown to think of it as our own here in the North. My great uncle grew broccoli in his garden and he called it asparagus cabbage. First make the pastry: mix the flours and the salt together in a large bowl, then crumble the butter in with your hands. Mix in the skyr or quark and bring together as a dough. Knead the dough with your hands. If you have a food processor, place all the ingredients in it and blend until it becomes smooth dough. Cover the dough with baking paper and add some dried beans or rice. Bake blind in the oven for 20 minutes. 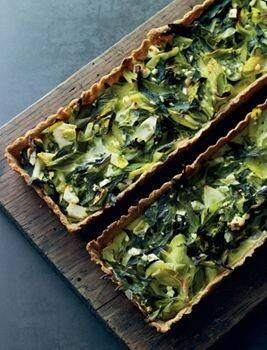 While the pastry is baking, rinse the chard well and cut it into pieces. Heat 1 tbsp oil in a pan and sauté the chard for 5 minutes. Drain in a colander. Using the same pan, add the remaining oil and sauté the spring onions for 2–3 minutes over a medium heat. Add the chard and thyme, mix well and remove from the heat. Beat the eggs in a large bowl, add the skyr or quark, cottage cheese, salt and pepper, then the chard mixture. Remove the beans or rice and the paper from the tart base. Pour the egg mix into the blind baked pastry case and bake again in the oven for 30 minutes. The tart revolution started in the 1970s, and I believe it was partly started in Denmark by the vegetarian restaurant chain Cranks, which opened a café in the centre of Copenhagen. I loved their savoury tarts with all kinds of vegetables. I still cook a lot of tarts, but I make a dough using quark and rye flour and I also use a low-fat dairy product instead of cream. First make the pastry: mix the flours and the salt together into a bowl, then crumble the butter in with your hands. Mix in the skyr or quark and bring together as a dough. Knead the dough with your hands. If you have a food processor, place all the ingredients in it and blend until it becomes smooth dough. If the dough does not come together, add a little water. Roll out the dough on a floured surface and butter a 28cm pie dish. Line the dish with the pastry and leave in the refrigerator to rest for 30 minutes. While the pastry is baking, rinse the leeks well. Heat 1 tbsp oil in a pan and sauté the leeks for about 5 minutes. Drain in a colander. Using the same pan, add the remaining oil and sauté the garlic and tarragon for a few minutes, then mix in the leeks and remove the pan from the heat. Beat the eggs in a mixing bowl and add the skyr or quark and goat cheese, then mix in the leek mixture. Remove the beans or rice and the paper from the tart base. Pour the mixture into the blind baked pastry case and bake again in the oven for 30 minutes. 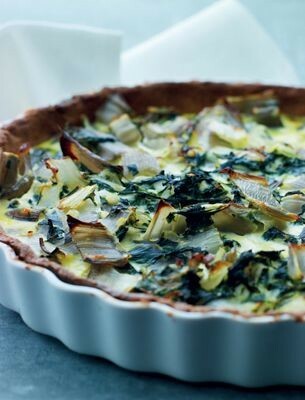 TIP A slice of this tart makes a perfect lunch to take to work. One of the best ways to rinse leeks is first to cut them in slices and then put them in a bowl of cold water and leave for 5 minutes. Lift out of the water so the grit stays at the bottom of the bowl. Sometimes you need to do this twice. Since my childhood, this has been one of my all-time favourites. We often had meat-free days, mostly because meat was expensive. I have changed it a bit now and made it lighter, without the heavy white sauce. This is perfect for dinner, and you can serve it with one of the grain salads on Salads with grains. Steam the cauliflower in salted water for about 5 minutes. Remove from the water right away and leave to cool. Fry the red onion in the olive oil until golden at the edges. Grease 4 small ramekins, or 1 big ovenproof dish, with the butter and sprinkle with breadcrumbs. Separate the eggs. Mix the yolks with the skyr or quark, cottage cheese and nutmeg. Fold into the cauliflower in a big mixing bowl, then add the red onions and season with salt and pepper. Whisk the egg whites lightly and fold into the cauliflower mixture. 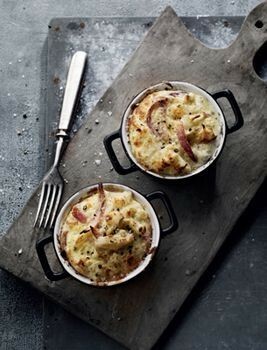 Spoon the cauliflower mixture into the prepared ramekins or dish and bake for about 30 minutes.